Producer, DJ, Radio Presenter, Promoter, ‘Musical Polymath’; Doorly seems to have already ticked off a lot of the things on any DJ’s Bucket List. Setting his place firmly within the House music scene, Doorly’s dedication to the craft of production and DJing remains paramount, with his live sets including samplers and FX units to emphasise his belief that a DJ set should be a live turntablism experience. Championed by top DJs, Mark Knight, Pete Tong, Cajmere, Groove Armada, Annie Mac, Steve ‘Silk’ Hurley & more, Doorly holds no boundaries in attracting the attention of the best. 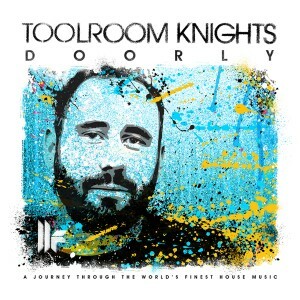 A collection of rolling house & deep groovers, ‘Toolroom Knights Mixed By Doorly’ broadcasts the very best of Doorly’s talent. With cleverly used acappella’s bring an exciting live feel to the mix and 5 brand new Exclusive tracks from Doorly, Sonny Fodera, Rory Lyons, Eric Sharp & People Get Real. Also including the works of Green Velvet, Claude VonStroke, Breach, Gerry Read, Oliver $, Jesse Rose, Eats Everything, Jaymo & Andy George and more, ‘Toolroom Knights Mixed By Doorly’ has everything a devoted House lover needs. After being discovered by Pete Tong and touted as his Future Star, Doorly quickly developed an eclectic back catalogue of exceptional tracks, releasing on respected labels including Toolroom Records, Cajul Records, Southern Fried and Dirty Bird. A highly versatile producer, he has provided remixes for artists including Steve ‘Silk’ Hurley, Kanye West, The Prodigy, Dizzee Rascal and Basement Jaxx, as well as collaborating with the likes of Grandmaster Flash and Shadow Child. Doorly’s acclaimed ‘The Boom Boom Room’ EP series, created in and named after his ‘Boom Boom Room’ Studios, has won him respect from the likes of Richie Hawtin, Loco Dice, Fatboy Slim, Cajmere and Groove Armada, with Radio 1 support from Annie Mac and Pete Tong, and has continually charted in the Beatport Deep House top 10. Yet, Doorly’s talents extend even further than this. Doorly’s dedication to the craft of DJing has cemented his reputation for mixing excellence. With sets being played out across four CDJs, plus samplers/FX units, he is a firm believer that a DJ set should be a live turntablism experience. Doorly continues to work alongside Pioneer as one of its Pro-DJ Ambassadors and is directly involved with testing, designing and training with Pioneer DJ equipment together with fellow DJs, James Zabiela, Zane Lowe, Eats Everything and Laidback Luke. It’s no wonder then that Doorly’s DJ sets are in great demand internationally, whether at huge parties on the rooftops of Austin at SXSW with Skream, Toddla T and Jackmaster, his self-organised 2000 capacity ‘secret’ warehouse parties in Downtown LA and the UK, or regular gigs in Ibiza at Pacha and Ibiza Rocks. Doorly’s track selector skills and mixing mastery can also be sampled on his immensely popular radio shows on London’s iconic Rinse FM and in the USA on iheartradio Dance Music station, Evolution Radio. Doorly seems to have already ticked off a lot of the things on any DJ’s Bucket List: Djing in Time Square New York, touring regularly alongside his hero and Inspiration Fatboy Slim, recording TWO BBC Radio 1 Essential Mixes, remixing iconic House anthems and regularly charting in the Beatport top 100. But this is merely the beginning: with big plans ahead, be prepared to see just what this talented and versatile producer and DJ can achieve.